Melee combat is one of the most difficult things to represent in a videogame. Whether it's swordfighting or hand-to-hand, street brawling or expert martial arts, taking an action that involves the entire human body, thousands of possible angles, speeds, and positions, before abstracting it into a simple series of button presses is an enormously complicated process. 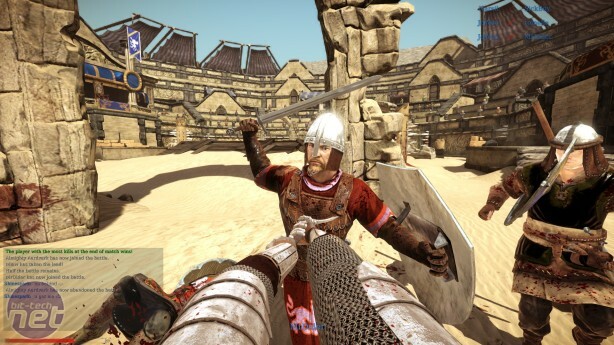 Over the last decade or so, advances in animation and physics simulation have enabled more complex representations, while many developers have begun paying much more attention to the nuances of melee combat, using historical research as the basis for their swordfights, or thinking up new ways for players to control their character and interact with those around them. I've been interested by melee combat games for a long time, and am always intrigued by any game that attempts to explore it in a new way. So I've compiled this list of the best melee combat games in existence. These games aren't necessarily about melee combat. They cover a range of genres, and happen to be good at it when they do it. All melee combat games are inevitably an abstraction of the real thing, and Nidhogg is probably the most abstract that swordfighting can get. 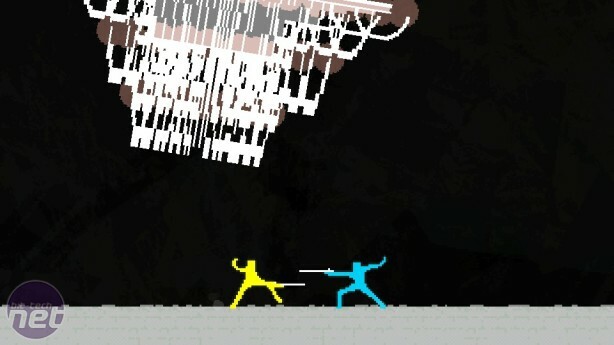 In doing so, though, Nidhogg reveals the essence of what makes a great melee combat game. 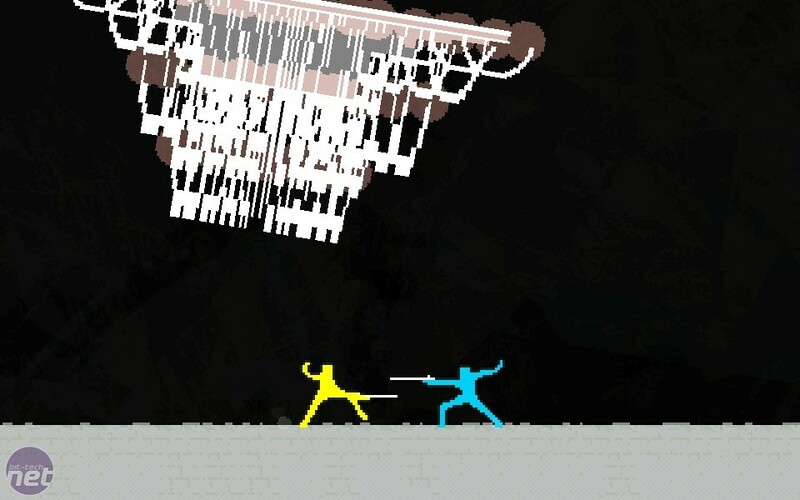 Nidhogg vaguely resembles a deadly version of rock, paper, scissors. Each player can hold their sword in three positions and enact a short lunge. If both swords are positioned at the same height, they'll clash. If they aren't, one player will likely get skewered. The swords are also constantly "active". In other words, if you accidentally run into your opponent's blade, bad things happen. Nidhogg combines this system with a few simple moves; jumping, rolling, the ability to throw your sword, and a speedy respawn to create a lightning-quick duelling game with tense back and forth fencing, crazy acrobatics, and often hilarious demises. The Witcher 3's combat has a fair few naysayers. I've seen complaints that it's too hard, too easy, too lightweight, too clumsy. I disagree completely. I think the combat in The Witcher 3 is superb, managing to stay coherent and engaging while enabling you to fight anything from a clueless bandit holding a club to a flying monster the size of hippo and twice as dangerous. 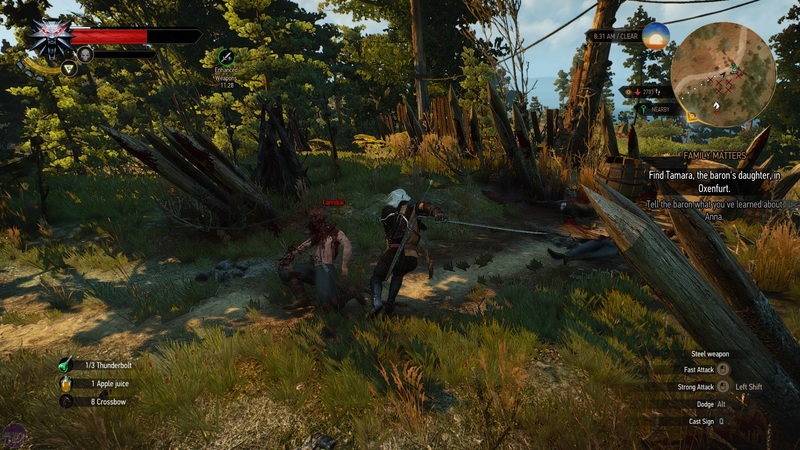 It has problems, mainly that Geralt's style is very flowery, frequently twirling his blade like helicopter rotor. But it also gets so much right. It understands that swords are light and lethal, rather than a sharpened club more for beating than cutting. It has a wonderful inherent logic that punishes you for being stupid. You can't just cut through a guy holding a shield, because he's holding a shield, and you can't block an attack from a giant, because it would smash all the bones in your arm into cereal. Groups of enemies actually work together to some degree, and don't just take turns to attack you. Most of all though, it feels unique to Geralt as a Witcher, not simply in the lithe skilfullness of the swordplay, but in all the preparation that comes before a fight, learning your opponent's weaknesses, brewing potions, making bombs. Every aspect of it reflects back upon his character, his place within the world he inhabits. The only game to tackle head-on the notion that melee combat involves the full-body, Toribash is an entirely physics driven brawling game where a contracted calf muscle can be the difference between a brilliant finishing move and falling flat on your face. The game is played out in slices of seconds, with each player taking turns to contract or relax various muscles and joints in their avatar's body. Through this system you can perform an infinite variety of punches, kicks, elbow-strikes, knee-strikes, throws and so forth. Entire martial arts have been recreated in Toribash, and if you were so inclined, you could probably design your own. Yet what makes Toribash special is how it communicates the imperfect nature of melee combat, that the perfect form you see in films or the finishing moves of Assassin's Creed nearly always goes out the window when your opponent is trying to kick your head off. The downside of such detail and freedom is that it takes time to learn. Initially you're as likely to break both your legs as you are to perform a reverse-roundhouse kick. But, as with all great melee combat games, failure is part of the fun. Torn Banner's follow-up to Chivalry is lacking the magic.